I love trying new recipes, so when I saw this beef and harissa flatbread in the Waitrose Weekend magazine I was keen to give it a go. With only four ingredients, it makes for a quick and easy supper dish. And while I thoroughly enjoyed it, unfortunately, it didn't go down quite so well with the four small ones. Mix 200 grams of self-raising flour and 200g of natural yoghurt into a bowl and knead to form a dough. 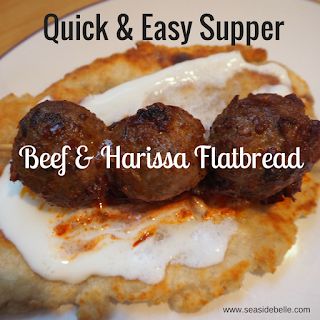 Set the dough to one side and marinade the beef meatballs in 2 tablespoons of harissa paste. Thread the meatballs onto metal skewers (I used pre-soaked wooden skewers as I didn't have any metal skewers). Grill the meatball skewers for 10-12 minutes, turning occasionally until they are cooked through. Meanwhile, divide the dough into four balls and flatten into discs on a well-floured surface. Fry the dough discs for one minute each side until they are browned and puffed up. Spread the flat breads with a couple of tablespoons of natural yoghurt, dot each with a teaspoon of harissa paste and then place the meatball skewers on top. This was a delicious light supper, which I wolfed down very quickly. The hot spice of the harissa paste is beautifully offset by the natural yoghurt and the freshness of the flatbread makes a really good base. Elliot, my ten year old, who is normally very cautious of new foods, thoroughly enjoyed the slightly exotic taste. However, the younger three were not so keen. As far as they are concerned, yoghurt should be strawberry flavoured and be served at breakfast. So they just ate the bits of flat bread that hadn't been touched by the yoghurt. Wilf, who is five, eventually relented and, once he got stuck in, enjoyed the meatballs. I'd love to make this a regular supper for the family. But it looks like it will be something I serve as a quick and easy adult meal. Why don't you try the recipe and let me know what you think?